Clifford LaBrecque, now 65 of Cameron, Missouri told the Examiner he had been watching the creature for about two and a half months on the outskirts of Des Moines, Iowa back in 1977. The fearful attack took place about 11 pm. That night LaBrecque decided to shoot the creature. "It was about 25 feet away from where I was parked in my pickup truck." LaBrecque said. "Two of the creatures walked up from behind a hedge. One stopped but the other went to a woodpile, bent down and started to eat with it back towards me. I stayed in the car and waited for it to turn around but it just kept on gnawing at the wood. Finally I decided to shoot it from behind. When the animals turned and saw me, I got buck fever and couldn't shoot. As it came towards me, I couldn't get the window rolled up fast enough. It was really close." LaBrecque was petrified with fear as the creature advanced. He tells what happened next. "It loomed over the car. It was about 8 feet tall. It reached through the window, grabbed me and shook the daylights out of me. It was terribly strong. I could feel its face about 6 inches away from mine and believe me I was in a state of tremendous fear. I could feel my whole body shaking. I felt a sensation of being twisted around and pushed down onto the floor. The creature's eyes were burning with fury. I was angry, very angry at me for trying to shoot it. Then I pass out. When I regained consciousness it was gone. NORFORK — What is believed to be the only sculpture in the world created to scale in meticulous detail of an adult specimen of the legendary "Bigfoot" resides in this Ozark town. 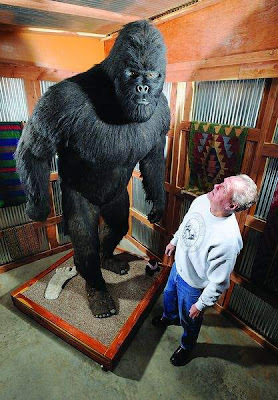 "It took three months to get it from my head to his (the sculptor's) head," said Clifford LaBrecque, 73, of the fiberglass-and-fur model of Bigfoot he commissioned in 1976 at a cost then of $9,000. "It's accurate to the inch," LaBrecque says. The striking model of Bigfoot stands 8 feet tall in the dining room of LaBrecque's home. He says it depicts accurately what LaBrecque remembers from sightings and a physical encounter with a Bigfoot specimen on June 18, 1977, and from many descriptions of the creature prior to his experience. The encounter happened, according to LaBrecque, between 9-10 p.m. near a woodpile behind LaBrecque's home in the Windsor Heights suburb of Des Moines, Iowa. Prior to the altercation, LaBrecque says he observed almost nightly a Bigfoot specimen — about 8 feet tall — that sometimes appeared with two apparently juvenile Bigfoot creatures. He says he called a Des Moines newspaper to tell of the sightings and had argued with the newspaper over copyrights to Bigfoot photographs should the newspaper act on his tip and obtain photographs. On June 18 he had decided to shoot to kill the larger Bigfoot and had positioned his car for the shot that he believed would furnish incontrovertible evidence of the reality of the Bigfoot creature. LaBrecque says he had been open-minded from an early age to the possibility that such a creature as Bigfoot existed. "When I was a little kid, I heard stories about the wild man of the west, and I began watching out for one," he said. The busy youth found countless stories about American Indian legends of the wild man, and stories of similar creatures all over the world. As an adult he interviewed many people who claimed to have sighted a Bigfoot specimen. But it was not until 1977 that his eyes gave him all the evidence he needed to believe in Bigfoot. "Then it dawned on me that my woodpile is this high and what we were seeing is much, much taller than the woodpile. I got my wife to look and she saw it. An inspection of the woodpile the next day and after subsequent sightings found bark pulled from the split wood and the inner surface of the tree bark gnawed away. That first sighting set in motion a series of sightings that would lead LaBrecque to spend night after night in the woods hoping to see the Bigfoot party traveling to the woodpile. He even conducted surveillance from settings in trees, but did not see the migration. LaBrecque understands the skepticism some people may bring to his story. At 73 he can do without it, along with the skepticism the public would bring to a videotape of what he says shows a Bigfoot in its natural habitat. He has shown the video privately but declines to show it publicly because of the ridicule that some people have for those who claim to have had unusual or paranormal experiences. "You are done before you start. You're not going to win that one." A showing of LaBrecque's Bigfoot model at the 1977 Iowa State Fair attracted many spectators, LaBrec-que said, and several with stories of Bigfoot sightings. After talking publicly about his Windsor Heights experience, LaBrecque says a farmer came forward to share a story of a Bigfoot sighting and to warn LaBrecque about continuing to talk about the incident. A second witness to the Windsor Heights incident has long stopped talking about it because of the skepticism, ridicule and laughter the story evokes from listeners, he says. "You have to understand just how hurtful this can be to the people who have seen Bigfoot," LaBrecque said. He says he has been the subject of extraordinary skepticism for his creation of the Bigfoot model before he actually saw Bigfoot. To LaBrecque it is simply good fortune that the sighting confirmed for him all that he had heard about the creature. It enabled him to better endure the scorn people bring to his story, he says. 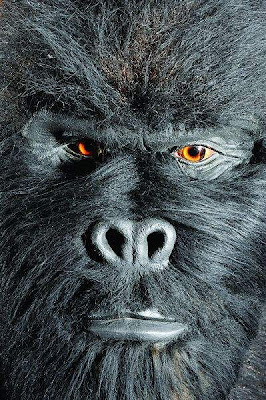 LaBrecque said he is resurfacing now in the Bigfoot culture only because of a news reporter's call and renewed interest in the creature that he says was sighted four years ago in a rural area near West Plains, Mo. "They're here in Norfork," LaBrecque said. "I have talked to people who have seen them." "This is what they say it looks like," LaBrecque says, pointing to his model. There is one report out that Mr. LaBreque has died. This is not a true fact as he is alive and still living in Norfork, Ar. I have seen Cliff's video. I just met him a week ago while vacationing in Norfork. I had never heard of him before. Very smart guy! !